All of Maggie's focus and free time is spent swimming. She's not only striving to earn scholarships—she's training to qualify for the Olympics. It helps that her best friend, Levi, is also on the team, and cheers her on. But Levi's already earned an Olympic tryout, so Maggie feels even more pressure to succeed. And it's not until Maggie's away on a college visit that she realizes how much of the "typical" high school experience she's missed by being in the pool. No one to shy away from a challenge, Maggie decides to squeeze the most out of her senior year. First up? Making out with a guy. And Levi could be the perfect candidate. After all, they already spend a lot of time together. But as Maggie slowly starts to uncover new feelings for Levi, how much is she willing to sacrifice in the water to win at love? Although this was my first read in the Hundred Oaks series, Coming Up for Air absolutely read wonderfully as a standalone. Since it combined two of my favorite tropes, friends-to-lovers and sports romance, I enjoyed this book so much! Both Maggie and Levi were well-written, well-developed characters and I felt their dialog and interactions were so realistic. 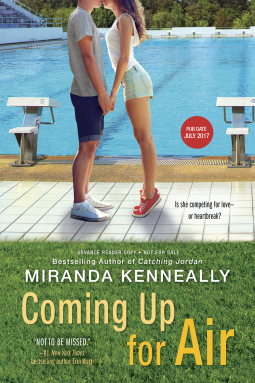 Although I am far from an expert on the sport of swimming, Miranda Kenneally did a great job explaining the intricacies of the sport so a newbie like me could follow and understand. A great YA read!